Example of the inscriptions present throughout the complex. As visible from this image, the upper regions are painted, suggesting (in cannon with other such temples) that the remain columns and ceilings would have been brightly painted. The temple roof representing the heavens would often display images of stars and birds, whereas the columns often boast images of palm plants, lotus and people. The faience (glazed ceramic earthenware) tile (above) is a reconstruction of wall decoration fragments found at the Temple of Malkata in stacks at the southwest corner. The gold spirals here were painted with gold paint, whereas the originals would have probably been covered by gold foil. Notably, similar patterns are found in the Pharaoh's Palace. ^ Winston, Alan. "An overview of the Giza Plateau in Egypt". Retrieved 26 July 2011. ^ a b c d e Reich, Lawrence S. Cunningham, John J. (2010). Culture and values : a survey of the humanities (7th ed.). Boston, MA: Wadsworth Cengage Learning. ISBN 0-495-56877-5. ^ "The 7 Wonders of the Ancient World". Archived from the original on 8 August 2011. Retrieved 26 July 2011. ^ Lehner, Mark. "The Pyramid of Khafre". The Complete Pyramids. Archived from the original on 28 July 2011. Retrieved 26 July 2011. 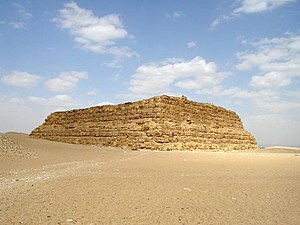 ^ "Pyramid of Mankaure". National Geographic: Egypt. National Geographic Society. Archived from the original on 2 October 2011. Retrieved 26 July 2011. ^ Wilkinson, R. (2000). The Complete Temples of Ancient Egypt. New York, Thames & Hudson. p. 154. ^ Gulio, Magli (2013). 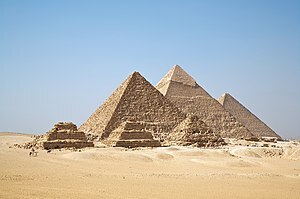 Architecture, Astronomy and Sacred Landscape in Ancient Egypt. Cambridge University Press. ^ Dieter, Arnold (2003). The encyclopaedia of ancient Egyptian architecture. I.B. Tauris. p. 196. ISBN 1-86064-465-1. ^ a b c d e f g h i j k Koltsida, Aikaterini (2007). "A Dark Spot in Ancient Egyptian Architecture: The Temple of Malkata". Journal of the American Research Center in Egypt. 43: 43–57 – via Jstor. ^ a b "Reconstruction of Geometric Decoration". Metropolitan Museum of Art. ^ Lansing, Ambrose (1918). "Excavations at the Palace of Amenhotep III at Thebes". The Metropolitan Museum of Art Bulletin. 13 – via Jstor. ^ a b c d e Lawrence, A. (1965). Ancient Egyptian Fortifications. The Journal of Egyptian Archaeology,51(1), 69-94. ^ a b c Clarke, S. (1916). ANCIENT EGYPTIAN FRONTIER FORTRESSES. Journal of Egyptian Archaeology, 3, 155. ^ a b c d e f g h i j Stanley, Jean-Daniel, et al. “Pelusium, an Ancient Port Fortress on Egypt's Nile Delta Coast: Its Evolving Environmental Setting from Foundation to Demise.” Journal of Coastal Research, vol. 24, no. 2, 2008, pp. 451–462. JSTOR, JSTOR, www.jstor.org/stable/30137849. ^ a b c d e Aaron A. Burke, et al. “Excavations of the New Kingdom Fortress in Jaffa, 2011–2014: Traces of Resistance to Egyptian Rule in Canaan.” American Journal of Archaeology, vol. 121, no. 1, 2017, pp. 85–133. JSTOR, JSTOR, www.jstor.org/stable/10.3764/aja.121.1.0085. ^ a b c d e L. E. R. “Two Mastaba Chambers.” Museum of Fine Arts Bulletin, vol. 8, no. 45, 1910, pp. 19–20. JSTOR, JSTOR, www.jstor.org/stable/4423469. ^ a b c d Badawy, Alexander. “The Ideology of the Superstructure of the Mastaba-Tomb in Egypt.” Journal of Near Eastern Studies, vol. 15, no. 3, 1956, pp. 180–183. JSTOR, JSTOR, www.jstor.org/stable/542310.